Heat oven to 450°F. Bake pie crust as directed on box for One-Crust Baked Shell, using 9-inch glass pie plate. Cool completely, about 15 minutes. Meanwhile in small bowl, sprinkle gelatin over 1/4 cup of the apricot nectar; let stand to soften. Set aside. In another small bowl, cut 1 can of the apricot halves into small pieces. Set aside. In blender or food processor, place remaining can apricot halves and remaining 3/4 cup apricot nectar. Cover; blend or process until smooth. In 2-quart saucepan, mix 1/2 cup sugar, the cornstarch and salt. Stir in milk and blended apricot mixture. (Mixture will look curdled.) Cook over medium heat, stirring constantly, until mixture heats to boiling and is slightly thickened. Boil 2 minutes, stirring constantly. Remove from heat. Blend a small amount of hot mixture into egg yolks. Return egg yolk mixture to saucepan; mix well. Over medium heat, heat to boiling, stirring constantly. Boil 2 minutes, stirring constantly. Remove from heat; stir in butter, 1/2 teaspoon vanilla and the gelatin mixture. Fold in 1/2 cup toasted coconut. Refrigerate about 30 minutes or until slightly thickened. Fold in apricot pieces. Spoon into crust. Cover; refrigerate about 45 minutes or until mixture is partially set. In large bowl, beat whipping cream until soft peaks form. Add 1 tablespoon sugar and 1/4 teaspoon vanilla; beat until stiff peaks form. Gently fold in apricot preserves. Pipe or spoon whipped cream mixture over cooled filling. Garnish with remaining 1/2 cup toasted coconut. Refrigerate 3 to 4 hours or until set. Cover and refrigerate any remaining pie. 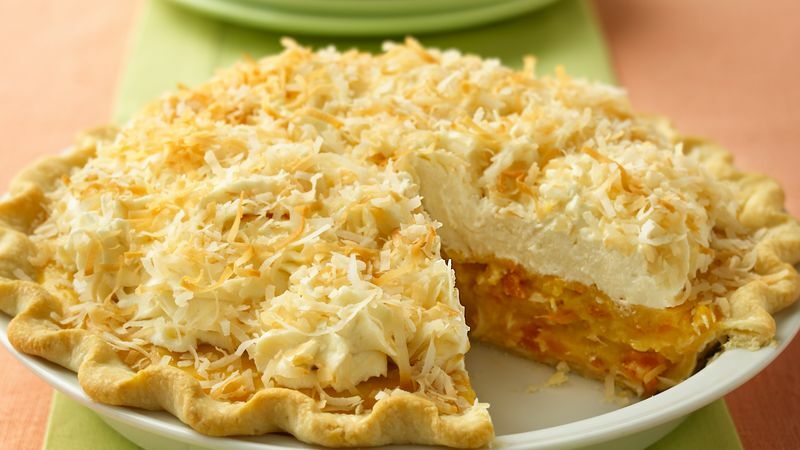 *To toast coconut, spread on cookie sheet; bake at 375°F about 5 minutes or until light golden brown. Or, spread in a thin layer in microwavable glass pie plate. Microwave on Medium (50%) 4 1/2 to 8 minutes or until light golden brown, tossing with fork after each minute.